Most “officially declared” weeks (or months or days) of something are kind of lame. We’re supposed to get all excited because someone decided that it’s National Rutabaga Month, or some such thing. But this week is a week that I can get behind. This is National Farmers Market Week, and if you’re not at one right now, go find one. According to the U.S. Department of Agriculture, there has been a 17 percent increase in the number of farmers markets nationwide between 2010 and 2011. If you could buy stock in them, it would probably be doing better than your 401K is right now. North Carolina made USDA’s list of top ten states in the numbers of farmers markets, with 217. No. 1 California sports 729 markets. Alaska and Texas showed the most growth in farmers markets during the past year. You can read the entire report here. A great list of North Carolina farmers markets is here. And the book “Farm Fresh North Carolina” by Diane Daniel (University of North Carolina Press, $18.95) offers information on local food around the state here. So, if you want to declare it National Rutabaga Month, Beet Week or whatever vegetable you like, that’s fine. Just buy it at a farmers market. If you’re rushing down Tryon Road, busy with Saturday errands, you might miss the little sign at the corner of Tryon and Dover Farm Road (near the intersection with Avent Ferry Road). It notes the presence of the farm for the Inter-Faith Food Shuttle’s Young Farmer Training Program and its farm stand. I’d whizzed by it a number of times, always planning to stop in. I finally did. Teens in the program learn about farming from the dirt to the business plan. More about it is here. A Food Shuttle spokesperson said that they are considering adding a CSA in the future. Teens who grow the vegetables on land right across the road sell them on Saturdays from 9 a.m. to 1 p.m. A lively clump of young farmers had their tunes turned up when I got there, but wanted to tell me plenty about their wares. On this day, they had swiss chard, melons, baby turnips and several varieties of tomatoes, among other things, all picked that morning. There were also grow-your-own oyster mushrooms: A bag of growing medium inoculated with mushroom spores. I was curious, but it would have turned into a cat-attracting object at my house, because the teen farmers told me you keep it indoors. I don’t think a lot of people are aware of this fresh little market. It’s always fun to buy good food from enthusiastic people. The market will operate through Oct. 15. He explained that Cincinnatus was an ancient Roman leader who entered public service only because he was needed, and left to go back to his farm as soon as the crises he was called upon to resolve were over, without seeking ultimate power. The society, The Hub continued, was formed at the end of the Revolutionary War to promote the ideals of citizen political service; Washington and Jefferson were members. “Uh, sure,” I said, and left before he could hand me a final exam. I was looking for lavender that I could use in an ongoing experiment: making lavender ice cream. When cooking with lavender, there’s a fine line between intriguingly tasty and choking on potpourri, and I’m slowly creeping up on it while trying not to cross over. Burns’ crops are organic, so the lavender is safe for use in cooking. She leaves her culinary lavender buds on stems, making the lavender easier to strain from liquid than the loose buds. Because I can never leave a farmers market solely with what I came for, I also got a Grilling Spice Rub. It contains oregano, marjoram, thyme, basil, sage and an herb called perilla, which is known as shiso in Asian cooking. At home, I mixed olive oil, lime juice and enough of the rub to make a paste, which I rubbed on flank steak. I let it sit at room temperature for about an hour, then hit the grill. The rub offered flavor and tenderness without a long marinating time. Before I left the booth, I told Burns about The Hub’s comments and the Society of the Cincinnati. She smiled and said, “I’ll have to look that up. Your husband certainly sounds interesting.” True, never a dull moment, as long as I can avoid history pop quizzes. A new program provides consumers a way to find locally produced food, and supports the farmers and artisans who produce it. Piedmont Grown certifies farmers markets, farmers and local food producers in the Triangle, Triad and Charlotte areas. In order to be part of the program and display its logo, the food involved must be from the 37-county area covered by Piedmont Grown. For example, farmers must certify that they produce the food they sell, and farmers markets must be producer-only markets. Participants must be certified annually, and there is a enrollment fee. About 100 farms and businesses have registered so far. A searchable index and other information is at the web site here. When the Carolina Farm Stewardship Association offered its Piedmont Farm Tour 16 years ago, there were a handful of Chatham County farms on the route. This year, you can visit a total of 40 farms, including six ones new to the tour, in a five-county area. The success of this tour indicates how much interest in local food has grown. And the tour is just fun. The tour will be held April 16 and 17. Tickets are $25 per car, so cram in the fam and hit the road. Visit here for more information. Some farms will sell their products, so carry along a cooler. If the ACC Tournament is coming up, that means it’s time to crank up the sausage balls. Oh, it also means farmers markets are reviving around the Triangle. The Campus Farmers Market at the N.C. State University Brickyard in Raleigh has reopened. And a new market is opening in Raleigh’s Boylan Heights. The Saturday Market at 301 Kinsey Street will offer a little bit of everything, including produce, food trucks and crafts. It will be open Saturdays 9 a.m. to 2 p.m. starting April 23. The market is on Facebook: http://www.facebook.com/pages/The-Saturday-Market/186432384727796. Thanks to Andrea Weigl’s blog Mouthful for alerting me to the market. worn wooden floors and minimal grocery items, but the draws were the meats and, to a lesser extent, produce. Most of the meats didn’t come from big companies because P&A was a small, independent place. It was the first time I got a sense that chicken could taste different from the stuff in the garish supermarket packages. The guys behind the butcher counter could tell you how to cook anything, from the sausage they ground in the store (scooped from a mound molded to look like a pig) to a fancy roast. I still use the method they recommended when I have occasion to roast a standing rib. I thought about P&A when I walked into Bickett Market, a new Raleigh, N.C. market near Five Points. The wooden floors of the building for one thing. But mostly that the produce, meats, breads and seafood, and a handful of condiments and other prepared items, are local. In some cases, the produce is extremely local. The market works with New Grass Gardens, a company that specializes in edible landscapes. “A lot of it is grown in my yard by New Grass, and other yards in the neighborhood,” says Jason Stegall of the market. The owners visit farms and select the pigs for the market’s pork offerings, including lard, which a recent missive to the store’s email list called it “ten times better than the best butter you have ever tasted…the all-natural fat is actually healthy for you.” Well, I don’t know about that health claim, but it does show the hands-on aspect of the market and their enthusiasm for products. The store also offers French Label Rouge heritage chickens from Triple T Farms in Fuquay-Varina, free-range eggs, coffee and roasted cornmeal from Muddy Dog Coffee Roasters, and other goodies. There’s a variety of local items – but don’t expect everything to be there all the time. 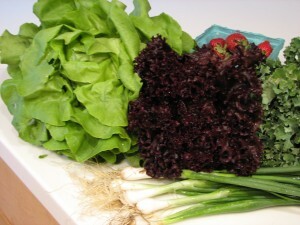 Many of the items are available in small amounts – produce, especially, as the weather and season dictate. Stegall says that most customers at the store, which has been open since mid-July, “get it,” that all-local, all-the-time can mean variability. Bickett received an unexpected number of shoppers recently due to an online coupon promotion, and Stegall said some shoppers brought in by the coupon didn’t understand why some items were sold out. It’s not easy to get to the market with the current road construction in the area, but there’s plenty of room once you get there. And for the neighborhood, it’s a real asset. Find out more about the market here, and sign up for the email list to find out the latest on what’s in the store. I love to see new farmer’s markets sprout. Residents of Raleigh’s Five Points have a new one in their own ‘hood as of May 1. The Five Points Farmers Market will operate each Saturday through Oct. 30, 8 a.m. to noon, in the parking lot of Nofo at The Pig on Fairview Road. According to market manager Anne Atkinson, there are nine permanent vendors, including Southport Seafood, Yellow Dog Bread Company and Bee Blessed Farm (honey and eggs). Two different guest vendors will be part of the market each week. to make salad for all in the immediate area of Moose Manor, thanks to the ample contents and the three large pots of leaf lettuce I’m growing on the patio. Planning, not my middle name. Fortunately, I have been on a trend of salad for lunch for several months and I’ve become creative with dressings. I prefer to make my own – it’s easy and tastes so much fresher than bottled dressing (probably less expensive, too). I can also leave out things I don’t want, like a ton of salt or sugar. Herb flavored vinegar, balsamic vinegar, chunks of garlic, shakes of herbs, lemon or lime juice, Dijon mustard, mashed avocado, even a dab or two of barbecue sauce all make nice friends with olive oil. The CSA alone would have made it a big week in the kitchen for me, but there was also the opening of the downtown Raleigh farmer’s market on Wednesday, on the end of Fayetteville Street near the convention center. Ed Mitchell of The Pit was cooking ‘cue, so the place was mobbed. But as a friend and I slogged through the crowd, I found North Carolina soft-shell crabs. I snatched them up like the pure spring gold that they are and ran home to my kitchen, where I did a little jig of delight and called my husband to share the news. There was one little thing about these soft-shells: I had to clean them myself. In this case, “clean” means dispatching them to crab heaven, because fresh soft-shell crabs are sold live. The fishmonger had always cleaned them for me before. As oil heated in my frying pan, I pulled the package from the refrigerator and unwrapped it. The crabs twitched slowly, like slightly drunk spiders. I followed instructions: Snip off just below the eyes with a pair of kitchen shears, open the top of the shell and pull out the gills, then snip off a triangular spot on the back. With that, I had killed my own food for the first time. Watch out, Ted Nugent. If you live in West Raleigh, there’s a small gem on the N.C. State University campus worth braving the parking hassles to visit. A completely student-run farmer’s market sets up on the Brickyard every Wednesday during the spring and fall semesters from 10 a.m. to 3 p.m.. And, yes, students came up with the idea. All vendors sell North Carolina-produced items. Besides fresh produce, there is exotic ravioli from the Pasta Wench in Boone, roasted corn cornmeal (it has an interesting smoky flavor) from Carolina Grits & Co. in Rocky Mount and other vendors. On April 14, the organizers are throwing “Localpalooza,” with food samples, music and information on finding locally produced food. With NCSU’s agricultural roots, a market makes sense; with the stereotype of student eating (pizza and burgers), it doesn’t. Read about how the market came about in my article here. For information on the market, visit its blog here. New cookbook! "Carolina Catch: Cooking North Carolina Fish and Shellfish from Mountains to Coast"